My dear husband cooked dinner today. I made the vegetable dish though. You may have noticed that I have been cooking a lot of asparagus recently. Well, right now the price is right. They must be in season somewhere, probably California. 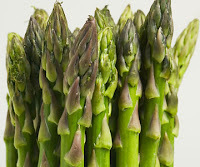 When they are not on sale, asparagus runs about $5.00 a lb. Right now, they are going for approximately $1.50 a lb to $2.00 a lb. depending on the store. We got tired of steamed asparagus, cream of asparagus soup, etc. I searched the internet and came up with this ONE We couldn't believe how simple yet so tasty this dish was! I will definitely be making more of this dish.